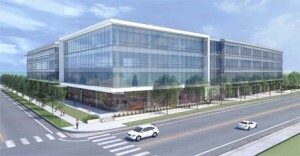 AUSTIN, Texas – (Oct. 13, 2015) – Regus, the world’s largest provider of flexible workspaces, announced today that it has signed a lease for approximately 18,000 square feet at Lamar Central, a Class-A, mixed-use development in Central Austin, located at 38th St. and N. Lamar Blvd. The Regus network includes 3,000 locations in more than 900 cities and 120 countries. Regus offers workspaces for businesses of any size – both large and small. Fully furnished offices, meeting rooms, business lounges and community spaces are available for any amount of time. Companies turn to Regus for affordability, ease of use and as an immediate entry point to business capitals around the world. The new office suite will overlook 38th Street and a portion of N. Lamar Blvd. and will be Regus’ 10th location in Austin. Regus is anticipated to open its doors by spring of 2016. Cushman & Wakefield/Oxford Commercial negotiated the lease on behalf of Highland Resources, and John Childers and Jake Ragusa of JLL negotiated the lease on behalf of Regus. “The expansion to Lamar Central is a smart move for Regus and further establishes its presence as a leading workspace solutions provider in a market that has increasingly become a destination for national and international employers,” said John Childers, Senior Vice President at JLL. Accompanying Regus at Lamar Central is Austin-based Kendra Scott Jewelry, who has secured the entire fourth floor of the building to relocate the company’s headquarters and will also open a storefront on the ground floor. Denver-based restaurant, Snooze, an A.M. Eatery, is also moving into a ground-floor retail space. The breakfast and lunch destination boasts a fresh and innovative menu, as well as extensive cocktail offerings. Lamar Central is nearing completion and is anticipated to open later this month. The four-story, 165,000-square-foot, mixed-use development features more than 132,000 square-feet of column-free office space with an additional 33,000 square-feet of retail and restaurant space. More information on the project and a time-lapse video of the construction process can be viewed at www.lamarcentral.com. Regus is the global leader in flexible workspace that can accommodate any size organization – from solopreneurs, to start-ups and from small- to medium-sized enterprises to global corporations. Regus offers a community of collaborative, flexible spaces to fit any budget. Regus’ breadth of offerings includes fully furnished offices, open and shared working areas, drop-in business lounges and meeting rooms. Regus customers have the freedom to book space for any period of time. The Regus network includes 3,000 business centers in more than 900 cities and 120 countries. More than two million customers visit a Regus location each day, enabling them to work whenever and wherever they need to. Companies such as Google, Toshiba and GlaxoSmithKline, to name a few, outsource their workspace needs to Regus so that their businesses can be more flexible and successful. Founded in Brussels, Belgium, in 1989, Regus is based in Luxembourg and listed on the London Stock Exchange. For more information, please visit www.regus.com.